Are you not satisfied with your current IT provider? Here are some things they might be doing that means it might be time to move on. IT companies are something every business needs. In today’s world, much of your business is run online, via email, your website, and any number of other technological tools. You store your important documents and data on servers or on the cloud, and you need someone to help you manage that. But this doesn’t mean that you have to settle for just any old IT company. 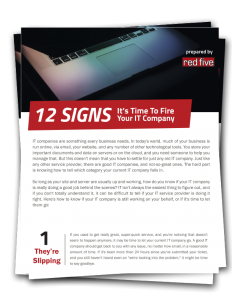 Download these 12 things to watch out for in your current IT company!